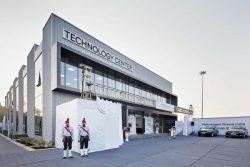 ŠKODA AUTO and Volkswagen have celebrated the opening of a new Technology Center in Pune, India, attended by Czech Prime Minister Andrej Babiš and other government officials. On behalf of the Volkswagen Group, ŠKODA is leading the INDIA 2.0 project, which sets out the Volkswagen Group’s model campaign on the Indian market. CNG vehicles may be forthcoming. The Technology Center in Chakan, around 30 kilometres north of Pune, represents the first major step in implementing the project. ŠKODA AUTO and the Volkswagen Group are jointly investing 250 million euros in research and development projects in India; most of the technical development is to be carried out locally. The Indian engineers will be responsible for project management, electronics, infotainment, body design, interior, chassis and complete vehicle. Boparai is widely reported to have stated that if India’s plan to become an economy powered by natural gas comes to fruition “there’s big scope for Volkswagen India in the CNG vehicle space”. This possibility also fits with Volkswagen’s 2016 declaration (by Dr. Jens Andersen, Group CEO for Natural Gas Mobility) that NGV development stands alongside EV as ‘ecologically equivalent’ prime pillars of focus for the global auto manufacturer. While meeting the same core standards for safety, quality and design that the Volkswagen Group represents worldwide, both ŠKODA and Volkswagen will be launching models with their own typical characteristics on the market. All of the planned models will meet the stricter safety and emission targets that will come into force in India in 2020 and beyond, which will even allow them to be exported to other emerging economies. In July 2018, the Volkswagen Group confirmed a EUR 1 billion investment in the INDIA 2.0 project, which will primarily be used in developing ŠKODA AUTO and Volkswagen vehicles for the Indian market.